On Friday 1st of March Dappled Cities are re-launching bands at Candys Apartments with an official launch party ‘Candy Darling Presents’ which will showcase the best in upcoming and established bands every Wednesday and Friday. Following the recent release of Dappled Cities celebrated 4th studio album, Lake Air, the band are thrilled to announce an exclusive intimate show at Candy’s Apartments Friday 1st March. 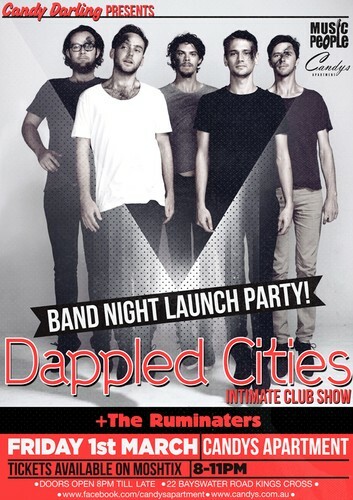 Coming off a year which saw the band sell out shows across the country and a recent highlight performance at Town Hall for Sydney Festival, Dappled Cities are returning for a rare and intimate club show at Candy’s Apartments. Tickets available on Moshtix Monday 18th February.